"Finalization" is the term used in the adopting world to signify 100% that you are the legal parent. Finalization means that, if for some crazy reason, birthdad finds out or cares that he fathered Megan, he can't get her, no matter what. It means we're finally safe... woohoo! Last night, I couldn't sleep. Last night, I thought for sure this was all too good to be true. I thought for sure that something would happen that would prevent us from Finalization today. I thought for sure that the Judge would be sick, or I thought for sure that all the papers got lost, or I thought for sure the birthdad would show up at the last minute and demand his rights be given. I thought for sure things would go foul, because they always have in the past. But that was then. Everything before Megan was hard and horrible and gut-wrenchingly difficult. As soon as Meg came home, life became amazing. Not that just the two of us wasn't wonderful... my husband is the best man I know and I love him dearly... but because we became complete. At least for now. Ah. I'm so happy. Here is Judge Lynn W. Davis, who granted us our Legal Happiness. Isn't that cute how he dressed up Megan in his robe and gavel? Lately I have been calling Megan "Goober." I'm fairly sure that "goober" means nut or peanut, or something of that sort. I really don't care. I'll call her whatever I want to; I'm the mommy. Anyway, you might remember that earlier this month I sent out a plea for help pertaining to Megan's sleeping habits. I was concerned about her swaddling, sleeping in her car seat, etc. Well, only two weeks later Megan has set a milestone for herself. She now falls asleep at night, swaddled up all nice & tight. She then somehow maneuvers her arms out (we figure she must work at it for quite some time), and proceeds to turn around in her bed. Pictures, of course, for your viewing pleasure. And, she wakes up like this! What a goober! I'm sure all babies do similar things, and I'm not the only mommy that finds it really funny, but I just want to remember it. Hence, this Blog Post. I am in a Card Club. Basically, we pick a theme each month, we all make 12 cards of that theme, and then we get together and switch the cards. It's great, because you end up with tons of adorable, homemade cards! We've had topics such as Baby Girl, Baby Boy, Get Well Soon, Valentines, and Blank. I do not consider myself a very crafty person. I'm not one of those Mormon Mommies who spends all her free time scrapbooking and sewing blankets. When I am going to get crafty, I have to prepare myself for it. I can't just break out my craftiness at a moment's notice. Luckily, Card Club gives me a whole month at a time to gear up and get ready for 2 days of card-making. However, when I do become crafty, I feel I can do a fairly decent job. I've always liked crafts, and I enjoy the finished product. I guess it's just that I can't bring myself to spend endless hours on something unless I have a really good reason for doing it. Card Club is a good reason. For me, it's more of a social thing; I need girl time. The cards are just a excuse to get together. Here are some of the cards I've made recently (most of them I made this month, actually). I take pictures of my cards, and the other cards I get, so that I have more ideas for cards. (I know, it's nerdy. But, I'm desperate for ideas). Usually I just make something up, and it turns out okay. Sorry, some of the pictures are blurry. But, you get the idea. Now I just need to remember to send them out to ya'll! 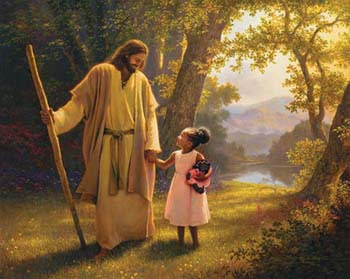 If you can't tell, it's Jesus walking hand-in-hand with a little black girl. It's probably my favorite picture of all time. (But, that's beside the point). Every time we stop and look at the picture- every time, without fail- Megan reaches out and touches Jesus in the picture. It makes me smile. Every time. I was watching the 9:00 news tonight and apparently there was a 4.9-magnitude earthquake in northern (waaaaaaaay northern) Utah. On the news they were saying that people from Springville (where I live) claim to have felt it. Where was I? I suppose I was too busy making dinner to notice. Either way, this has given me an idea of what to write about. I've had several friends do posts with random things about themselves. So, here I go: random things about Yours Truly, with earthquakes at the top of the list. 1.) I've always been afraid of 2 things since I was a kid: earthquakes & fires. My reasoning? You can't really run away from either one. 2.) My nails (finger & toe) are really strong. 3.) Though I teach piano lessons, I'm not as great at playing as you might think. I still have to practice a lot on hard songs. And, I have a hard time concentrating for more than 20 minutes at a time. I do, however, excel in music theory and I know a handful of ways to teach music to a child. I think that's something that makes me a good teacher. 4.) I like to relax by watching TV. But, I probably shouldn't have admitted that. 5.) I love Papa John's Pizza. I get it every year on my birthday. 6.) I looooooooooooove to sing. I sing all day long, with my best voice. Megan loves it. Or, at least, she pretends to love it. 7.) I always have to blow my nose before I go to bed. If I have even the tiniest booger in my nostril, I can't fall asleep. 8.) I often have dreams that I'm in a play and forget my lines. It's always a High School play. 9.) I hate bugs with a passion. If our house had a bug problem, I would convince my husband we need to sell the house. 10.) I look into people's houses as I drive by, to see if I can tell what their floorplan is. I'm a total floorplan junkie. I wanted to be an architect until I realized how many math classes I would need to take. 11.) Funny enough, if I went back to school for a graduate degree, I'd probably do it in Math. Then, I'd teach middle school or high school math. Being a music teacher is too much work for the money. 12.) In High School, I had the top of my right ear pierced. Man, I was such a rebel. 13.) Jared was the 2nd boy I ever kissed. And, he'll be the last. 14.) If I don't write something down, I almost always forget to do it (or buy it, or clean it, etc.). 15.) I do a killer Witch voice. 16.) I really, really hate cleaning the bathrooms. I should do it more often. Waaay more often, actually. 17.) I am good at word games (like Scattergories, Boggle, & Balderdash). I also love playing strategy games. 18.) I really miss sleeping in on the weekends. 19.) I wish someone from one of those house shows on TV would come decorate my house for me. I watch the shows to get ideas, but it gets me nowhere. 20.) My favorite number is 18,522. When I was younger I wanted to be different, and I decided that having a strange "favorite number" might do the trick. I'm not kidding, though. If you at any time ask me for my favorite number, I will say 18,522. Oh, and 21.) I enjoy taking unflattering pictures of myself and sharing them with the public. Jared says, "don't fix it if it ain't broke." Well, I've decided nothing really was ever wrong or amiss with Megan's sleeping habits, so I'm not going to change anything. And, I think I found a thinner swaddle blanket that'll do the job, so for now she'll be swaddled in the car seat during the day, and swaddled in her crib at night. I'm not changing a thing. At least not for now. I figure she'll let me know when it's not working for her, and then I'll deal with it. Thanks for all your advice! Okay, mommies. If you've ever swaddled your baby, please keep reading. I need your expertise. Problem #1: Megan's doctor said she should be sleeping on her back (lowers the risk of SIDS, right?) but Megan would always wake herself up when her arms would jerk around. Hence, I started swaddling her. She's been swaddled for every sleeping period since she was about a month old, and sleeps like an angel. Problem #2: In addition to being swaddled, Megan has taken all daytime naps in her car seat since about a month old. (The car seat is in her bedroom when she's sleeping in it). It is not what I preferred, but I needed her to sleep for extended periods of time when I taught piano lessons. It worked like a charm! She would sleep 2 1/2 - 3 hours in her car seat, whereas she would only sleep 45 minutes in her crib. Long story short: Megan takes all naps swaddled in her car seat. Now comes my dilemma. You see, it is getting hot here. When I get Meg up from her naps she is really hot, even if I strip her down to a short-sleeved onesie under the blanket. I haven't found a thin blanket that works for swaddling. She does have a ceiling fan in her room, but that doesn't change the fact that she's still really hot under that blanket. So, I'm forced to think I should wean her from the swaddle. In fact, I tried today. At first, I just held her like I usually do before a nap, and put her on her back in her crib. Crying time: 20 minutes. Then I went back in and mock-swaddled her (just from her armpits down, so she'd still feel the tight comfort). Crying time: 1 hour 5 minutes. Then she was screaming so loud and crying so hard I swear she was going to choke on her own saliva. So, I gave in, wrapped her in her swaddle, put her in the carseat and she was out like a light. I now realize that I may have made a little Sleeping Monster with Megan. She is an angel and sleeps 18 hours a day- but only if she's swaddled. I just don't feel comfortable keeping her swaddled during the day when it's so hot. Plus, she's 6 months old, which is probably old enough to stop the swaddling, right? I'm afraid one day she'll decide to roll over in the middle of the night (she's swaddled at night in her crib), not be able to move, and then I have no more baby. Another note: I teach piano lessons Monday-Thursday, so that only leaves me, basically, three days in which to wean Megan before she has to be back on a schedule. Every time there's a holiday, I feel a need to dress up Megan in some cute holiday-type outfit and snap a bunch of pictures. In fact, I constantly feel the urge to dress her up and go picture-happy. This obsessive picture-taking may stem from the fact that every month we have to send Megan's birthmom a photo album. The album has 36 pictures, which averages out to more than one cute picture per day. That's a lot of pressure! Getting 36 very cute pictures is harder than it might seem. Plus, she has to be in different outfits as often as possible (I can't have her birthmother thinking Megan only has 2 onesies)! This might also be a reason that I might spend a little more money on her clothes than I should. I feel like these pictures are the only real substance her birthmother has from which to feel than Megan is well taken care-of. The letters and pictures are part of a contract we signed with our adoption agency. We will continue to do this until Megan turns one, and then we just send pictures whenever we want (holidays, birthdays). I get excited when we have a holiday, because it's a nice excuse to dress her up and have some photo shoots. Also, I feel more comfortable putting several pictures of her in the same outfit in the album if it is for a holiday! We dressed up Megan today and took some adorable pictures. Oh. My. Goodness. I just can't get enough of her. So, as usual, you're stuck looking a a dozen pictures of our little angel. When Megan woke up this morning she asked me for her Easter basket. Here she is next to it. The Easter Bunny gave her rice cereal, a sippy cup, bowl & spoon, sweet potatoes, & a bib. It actually worked out nicely for the Easter Bunny to bring her these things, because we just started Megan on solids this past Friday! Here she is, sifting through her Easter treasures. After 5 tedious minutes of sitting up, she was done with this photo shoot! Later, we dressed her up again, this time in her Easter Dress. Here she is in a basket. I just had to get a picture of her holding an Easter Egg. I really was quite surprised that she didn't put it in her mouth! One more. I love this girl. This last one is for Grandma P because she loves the naked baby pictures.